Yes, you read it right! Legendary iPhone hacker chpwn has, with a little help from stroughtonsmith, managed to successfully port Apple’s new system-wide voice recognition feature through to the equally legendary old-timer that is the iPhone 3GS. 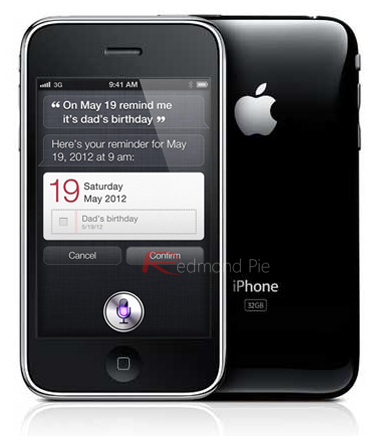 The iPhone 3GS has been a great asset to Apple since it’s launch all the way back in the middle of 2009, and continues – to this day – to sell and compete with more recent devices on the smartphone market. Since Siri was launched along with iPhone 4S as an exclusive feature to Apple’s very latest smartphone, it has scarcely been away from the headlines. Developers have been plugging away to see what the software can really do when unleashed, and if the progress thus far is anything to go by, Siri will be singing songs whilst flipping eggs for your breakfast in no time! Jokes aside, though, the latest inroads only further increase the suspicion that the fruit company kept Siri as an iPhone 4S-only feature in order to increase sales. It was said that Apple’s first dual-core smartphone was the only device capable of handling the new, exciting technology; but the work of chpwn and friends has certainly made that claim appear as a simple, sensible marketing ploy. Those who doubted the need for jailbreaking and hacking to continue with Apple bringing 200 new features to iOS 5, (many of which had been lingering annoyances since day one), need look no further than here, because despite the positive progress being made by the Cupertino company in delivering the updates to its mobile operating system, the inroads being made within the jailbreaking spectrum are just as exciting – and just as important in dictating the future direction of iOS.